Today, the FM students visited to the Salvatore Ferragamo headquarters, located here in Florence above the Ferragamo flagship and museum. The corporate offices are in an incredible Renaissance palace, belonging to Ferragamo since the 1940’s. We met with their Management/Merchandising team, an elegant group who carry out all of the production, from sourcing raw materials and working with the design team, to fashion shows and in-store delivery which is of course, global. It’s inspiring to see how the legacy of Salvatore is carried out and translated to RTW, something that Mr. Ferragamo did not specifically specialize in. The team still uses values and construction processes from almost century ago. 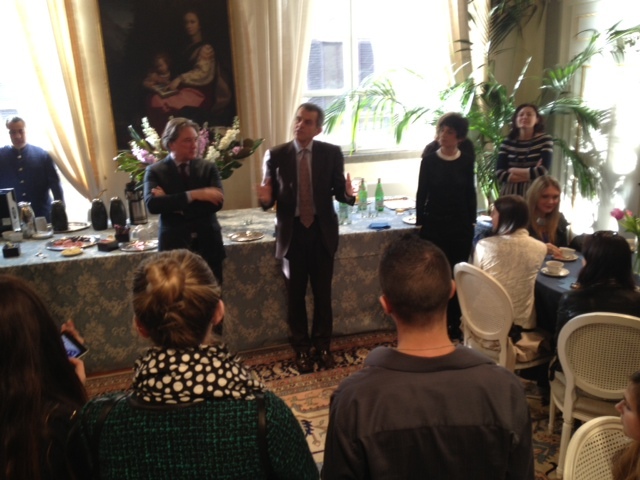 After a lovely and informative presentation, we had a coffee reception with the team and heard some wise words from Ferruccio Ferragamo, son of Salvatore, pictured below. What a privilege! We then concluded our appointment with a visit to the museum, now featuring an exhibit of Marilyn Monroe.